Red Bean: I want to live somewhere peaceful, that isn't at war. Red Bean Pudding: Iraq? There's no war in Iraq. Or go to heaven, they have clean air! 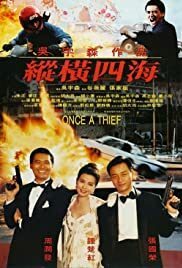 Chow Yun Fat, Leslie Cheung and Cherie Chung make an attractive trio of art thieves who are double-crossed by gangsters after pulling off a job. Naturally they plot revenge. The story emphasis here is on elaborate and suspenseful heists being played out, and on charming banter amongst the main trio of characters, with the violent gun action largely reserved for the finale. The tone is lighter than most of Woo's film of this period, and the characters are more enjoyable. The glossy look reminds the viewer of the elaborate heist movies in vogue in the middle 60s, such as The Pink Panther or Topkapi and this one is similarly enjoyable time-passer.